I had no intention of drawing this evening, but after quite an eventful day felt the need to pass time. There are worse ways. Fortunately, just as said urge took hold, I came across another charmingly set photato of a drainage mill in South Walsham and had started really before I was aware – and, evidently, went in quite heavy. 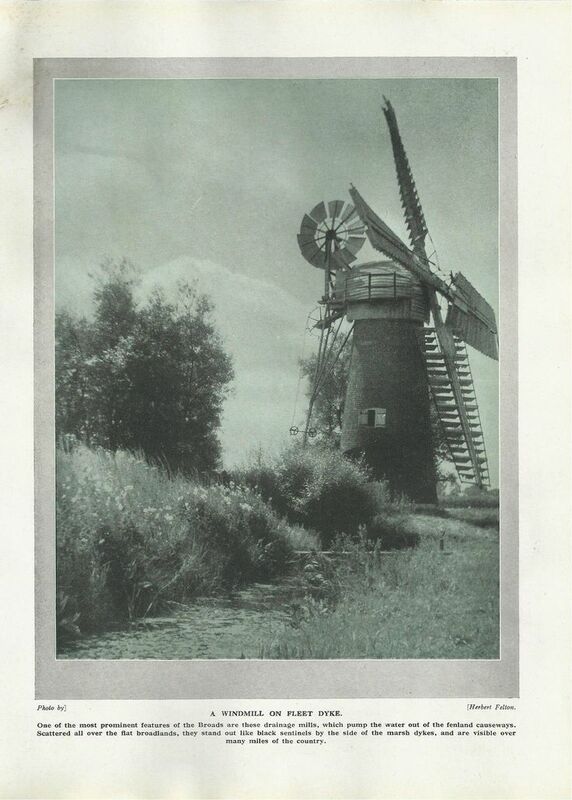 Though the caption mentions Fleet Dyke; I can’t seem to find much more about specific mills there, so her fate post-reference is up in the air. There’s not really much more to say, I suppose, other than how pleasingly right it seems for me to once again be enchanted by windmills, drawing windmills and turning to them for comfort. It’s one of the many good things I owe to this blog. As I’ve previously mentioned, it was always the way as a little boy, so I shouldn’t be surprised about the return as much as why I ever stopped in the first place! An interlude, at least, in that we’ve broken away from Norfolk and plunged into Suffolk – gasp! As it’s Saturday night – it’s party time and not one minute we can lose! – I opted to go wild in such a way and… draw a windmill. Here we have Pakenham Mill, situated near Burgh St Edmunds. Built in 1830, it has stayed in resplendent condition for most of its life, and in 2001 was brought back to full working order. It stands not too far away from an equally beautiful watermill; I believe both are open to visitors. Though always something of a star, the mill had a wider brush with celebrity some fifty or sixty years ago. Its operation was shot by the BBC as part of a series of short Interlude films – a placeholder while studios were dressed for the next programme, or to cover any breakdowns in still relatively new technology. The ethos of ‘mildly engaging but not so much that anything would be missed by looking away’ makes the circular motion of the windmill’s sails a perfect fit. As you can probably guess, though, I find it hard to imagine looking away – where were these when I was a child? Or a good owd eel well fry’d. I’m not sure I’ve included a single figure in my old-time Norfolk landscapes so far. While that is perfectly permissible in a setting very possibly devoid of people, it seemed about time to glance at those who might be patrolling the scene. The marshmen were a hardy bunch, fighting an unending battle day and night with the sea in order to keep land fit for farmers and cattle – fit for trade. Trudging around out there in the dark depths of winter makes me shudder just in prospect, never mind actually doing it! But this was just what needed to be done – and, in doing just that, these men shaped the Broads into what it is today. Today, of course, many of their duties are usurped by machinery, though there are still groups who train and work as marshmen on the Broads, particularly the art of reed-cutting, in a bid to keep the traditional practice alive. This fine chap was drawn from Home from the Marshes, a shot by naturalist photographer Peter Henry Emerson, whose 1887 body of images, Life and Landscape of the Norfolk Broads, has proven a particular inspiration since discovering them. Long charmed by the unassuming beauty of the area – to the extent that he’d subsequently revisit East Anglia a number of times – Emerson’s works form an intimate and extremely valuable insight into the people going about duty and leisure and creating an almost effortless intrigue, a pondering of what book-ended this snapshot. I wonder if this particular bor got his Norfolk dumplings come home time? One hopes. Great Yarmouth is full of relics, and that’s before we’ve even come to my parents. Thank goodness, too, for these sights bring a touch of inspiration and character that’s very much needed. Perhaps nowhere calls for it more than the dockland of the South Denes; once host to a thriving holiday park, the resort now gives way to a joyless maze of warehouses and oil tanks until, somewhere amid the heightening grime, Nelson’s Monument pops up – Britannia standing proudly out of sync. Perhaps, then, this nineteenth century gasometer frame is a fitting reminder of the town’s legacy in energy, harking back to when the town was a burgeoning powerhouse. The fluctuating drum would have stored a tremendous amount of coal gas ready for distribution – the masses connected. A toxic monster of its day, but in retirement it possesses a period ornateness that has it sticking out as prominently as the Monument. The most charming thing of the structure is surely the elaborate finials; a stepped-out spire beneath flowing volutes. I thought this might make for an interesting construction. I was wrong, but still am glad to have completed it. It’s something that’s been in my eye-line forever, and, as it’s a listed structure, I presume it’ll be there for a while yet. It could do with a lick of paint, mind you! Not having a clue of its application and just seeing an empty, looming frame, I used to call it a giant’s fireguard. Hmm. Still, I think that’s probably more romantic than the reality! I thought the village an appropriate subject to bring life to what has, of late, been a rather sleepy place! There’s probably something to be said for the state of the windmill, too, but we shan’t go there. Standing on the border of Little Snoring and neighbouring Great Snoring, this trestle mill, replete with its trendy porch, worked producing flour from 1805 to at least 1922, ultimately being dismantled in 1950. Curiously, the trestle foundation was left in place and remains apparent, though the site itself is now overrun by vegetation. A landmark about Little Snoring that you can see today is St Andrew’s, yet another round tower church, a trademark of East Anglia, and subjected to numerous cosmetic changes over the centuries. The Norman tower of flint actually stands a few feet detached from the present building, and is capped not by a traditional spire but a nineteenth century conical cap, complete with lookout gables and spike. It certainly captured my eye. Many thanks to the wonderful website of Tricia Booth, whose extensive knowledge on the Snorings made an unplanned voyage most interesting. I should quite like to visit one day. With that, we wake – one hopes!